Let it be known that these dreams are 100% real, as in yes, I really did have these dreams. Oh, hello there. I didn't see you all come in — mainly because we are outside. Well, since we're all here I'll just reach into my refreshment log and we can drink to our hearts content. And, matter-of-factly, I shall regale you with many a story as we engulf our delicious beverages! These stories will be of the manliest dreams I've had, so pop a squat on my listening stumps and take heed — the adventure begins! Let me just grab one of my story beavers. Let's see what I carved on the back of this one — ah, yes! This is how I blew up a moose. I began my trek in a forest. The lush green grass and leaves welcomed me into their domain; they surrounded and embraced me into their home. The branches swayed in the wind as it whipped through them. The wind, then, began to whip into me. I whipped back. The wind died. I continued my journey and walked as deftly and boldly as I could through the forest and, within a few minutes, I came to a clearing. There, standing before me, was the most majestic moose I'd ever seen. We stood in awe of each other. I was taken back by the size of its antlers — it of my statuesque, muscular form. It began walking and came close to me — too close. And I did what any normal human being would do in my position. I punched it in the face. It exploded into a cataclysmic fireball that engulfed the forest and the plains. I remained untouched, as fire knew at that point not to mess with me. Oh, what a wonderful dream. I have no further use for this beaver. Guess I'll whittle it into a slipper. Let's see what other dreams I have. Oh! This is how I blew up an elk! I began my trek in a forest — actually this is just the same dream. Seems I elbowed the elk and it exploded into a poetic spray of blood. Well then, let's just move on, shall we? Let me just grab another story beaver — ah, here we go. What do we have here? Mmmmm! 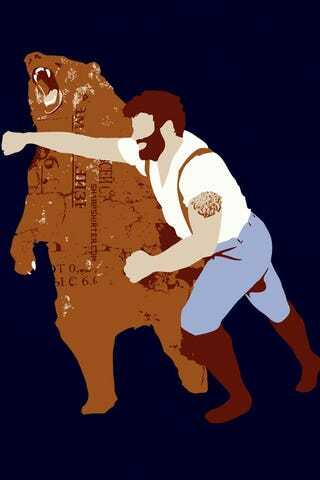 This is how I killed a bear. I walked into my house after finishing another long day of high school. I closed the door, sat my backpack down, and set my gaze toward the kitchen — where a giant grizzly bear was waiting for me. I reached back toward the door and grabbed the doorknob . . . and broke it. There would be no escape for either of us. The bear roared a challenge at me and I responded by running as quickly as I could to the living room. It gave chase. I entered the room, leapt over the coffee table and turned mid-flight only to be met by the bear lunging toward me. I landed on the couch and the bear on me. Holding it by the neck with my left hand, I began bludgeoning it with my right, with doorknob in hand. The blows proved quite effective until it raised an arm and clawed me in the face. It hurt. But I had a plan — kill it. I landed blow after blow into its face with the doorknob and it retaliated with thunderous punches that tore into my rippling man meat. Its final attack knocked me toward the ground and there I found the tool to its demise: A fork! I sat back up and stabbed its right paw as it came down toward my face. I grabbed the scruff under its jaw, pulled its head down, and impaled the fork through the top of its head! I was victorious! Phew! I hope you are enjoying these dream-stories as much as I am. Grab yourselves another drink if need be, good friends. They are always in ample supply. I'm going to go hand-crush this maple tree over here as I am in dire need of syrup. I decided to eat these beavers instead of whittling them into clothing and accessories. I think syrup will go well with them. Anyway, here is my final tale — my favorite, actually! This is how I fought a pack of wolves in an office building. I was working in a cubicle; the lights dim as I decided to work late. I stood up to stretch and turned around. There before me stood a pack of five wolves. They were hungry, ravenous. So were my biceps. The first wolf lunged at me and I punched it in the nose and it flew backward crashing into an adjacent cubicle. A second jumped at me and I caught it just before it snapped its jaws into my handsome and rugged face. Holding it with one hand I slammed my fist into the left side of its face. My fist exited on the right side. I slid my trophy off my arm as a third caught me off-guard. I boldly assumed a defensive stance and its jaws clinched tightly around the upper-part of my left forearm. I howled in rage and delight, as I found a foe truly worthy of my muscles! I knew a simple punch would not best this creature. In fact, there was only one way I could kill this wolf! I pushed it against the wall of my cubicle and used it as leverage — because I grabbed my wrist and broke my forearm in half. The bone protruded from my skin, toward the wolf. I yelled, 'Chew on this!' and rammed the bone into the wolf's skull and killed it. Then I threw the remaining wolves out a window. Gravity! Well, my friends. That concludes my dream-stories for the time being. I'm sure I have more lying in seclusion, waiting to be read. If you happen to make your way back into my neck of the woods stay away from the otters. They are landmines filled with P90x Recovery Drink. I need it after my workouts, but I can't just go make it. No. I need a challenge. I also put spinning lawnmower blades in my underwear drawer! My house is really unsafe. Share with me, my friends, your greatest and wildest dreams! I look forwards to hearing them.